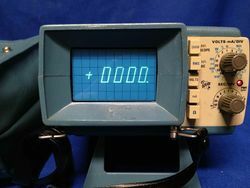 The Tektronix 213 is a miniature portable oscilloscope introduced in 1975. It combines a 3½-digit DMM and a 1 MHz single channel scope in one unit. The maximum sweep rate is 0.4 μs/div with ×10 sweep magnifier. The 213 provides true RMS voltage and current measurements. It is battery or AC line powered. The 213 makes use of two Tek-made custom chips, the 155-0048-01 trigger sweep circuit, and the 155-0114-00 7-segment character generator in the DVM circuit. In addition, it includes some standard opamps (741, 324) and a 4-digit decimal counter (Mostek MK5007). This page was last edited on 10 April 2019, at 14:10.